When we speak of the cross, we should not forget that we are in Jerusalem. I believe that Jerusalem reveals the basic meaning of the cross through Jesus’ death and resurrection. This meaning relates to the mystery that has been hidden since the world’s creation. Jesus on the cross revealed it. The mystery is that death by itself is defeat, destruction, and division. Jesus on the cross revealed that life is at the heart of the cross…. Not on the side of the cross there is life. Not behind the cross there is life. Not in front of the cross there is life. In the heart of the cross there is life. Through that way, Jesus discovered the dynamics and the dialectics of human life. This dialectic relates to death and life. That is why the person who refuses death refuses resurrection. In death, there are the seeds of resurrection. The one who does not know how to die does not know how to live. For example, when the baby becomes an adolescent, if he does not leave his baby-ness behind and enters a new phase of his life, people usually tells him, “You are still a baby.” The same applies to the youth who wishes to remain an adolescent. If he does not leave adolescence behind so as to enter adulthood, he does not know how to die in order to live…. To live means to accept death. We even accept the final death because we know there is life in it. 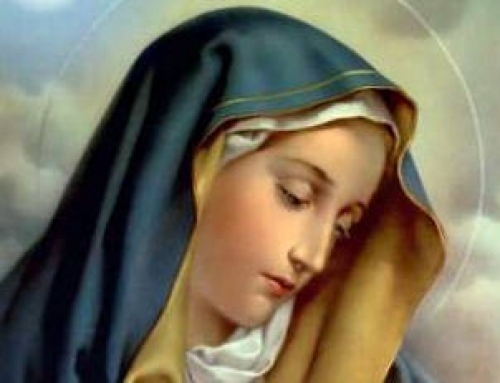 Jesus on the cross revealed an awesome dialectic in human life: first, the dialectic of death and life, and second, the interconnectedness between the two, meaning that death contains the seeds of life and life contains the seeds of death, which become the seeds of life. As we say in Liturgy, the cross is not a symbol of death but the cross becomes a tree of life. Jesus revealed that the cross is a tree of life and not a symbol of death. This is essential in the lives of individuals and nations. The Palestinian nation was submitted to death. In the midst of this death, there are the seeds of life. The Palestinians need to know how to discover the seeds of life in the midst of death in order to be able to grow, to give themselves a future. This mystery is not evident. Jesus revealed it but the mystery is found within each of us. If I do not enter into the dynamics of this mystery, death might kill me. It is my responsibility to discover the seeds of life within death …. That is the mystery. Jerusalem is the city of a thousand challenges. However, challenges are the path to life…. Unfortunately, many of our Christians are attached to the cross as a symbol of death, not as a tree of life. That is why they cannot handle difficulties. According to them, there is no real life in the midst of difficulties. Why stay? That is why they emigrate. There is external emigration, when people change location, and there is internal emigration when people encapsulate themselves so as not to give life. Because when I live the cross and discover in it the seeds of life, not only will I live, but I welcome life and give life. When I stop welcoming and giving life, or if I distance myself, I become encapsulated and childish. I live at the expense of others instead of helping others. I become a parasite. That is the mystery, and it is not easy to penetrate it. That is the meaning of our presence in the Holy Land: We accept life, preach life, and give life. The question of the big or the strong will melt away. We have a treasure. We have a formidable energy to give life if there is meaning to our existence. Then I do not emigrate. I remain. It may be difficult to live, it may be difficult to survive but I discover the seeds of life. Those who remain might be small in number but that is alright. The disciples were few but they lived happily ever after. They discovered the mystery of life. 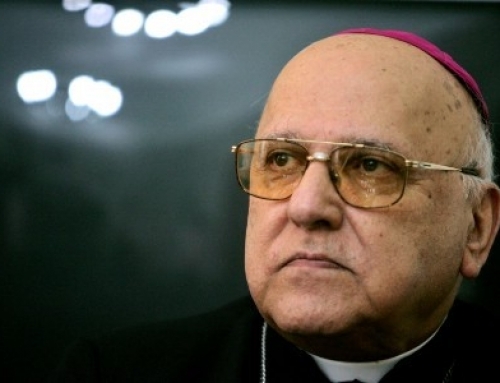 HCEF Palestinian Christians: In Their Own Words. 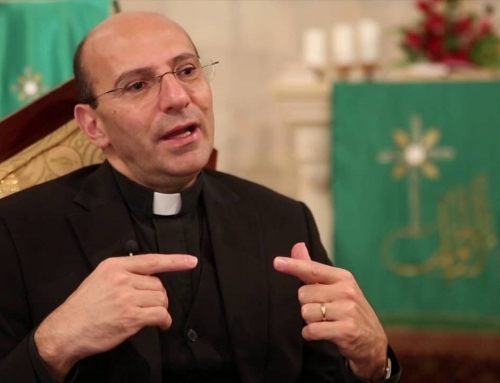 **Father Rafiq Khoury is a renowned theologian and preacher, specializing in Pastoral Theology and Catechism with the Patriarchal Diocese of Jerusalem. In an interview with Saliba Sarsar in Jerusalem in July 2008, he spoke of how to live with the cross, especially during hard times, as is happening in Jerusalem and the rest of the Holy Land. The tape was misplaced and only found recently, but Father Khoury’s message is as relevant now as then, which Saliba transcribed and translated from Arabic. 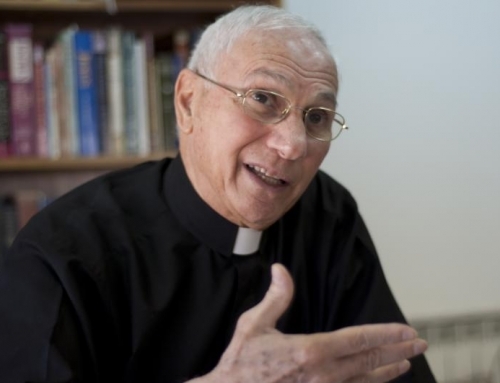 Father Khoury was born in the Palestinian Christian village of Taybeh. He holds a Ph.D. from the Lateran University in Rome, serves as a board member of the Al-Liqa’ Center for Religious and Heritage Studies in the Holy Land, and was the Secretary General of the Synod of the Catholic Churches of the Holy Land. +“The History of Jerusalem: A Christian Perspective,” in The Spiritual Significance of Jerusalem for Jews, Christians, and Muslims, ed. Hans Ucki. World Council of Churches, 1994, pp. 9-20. 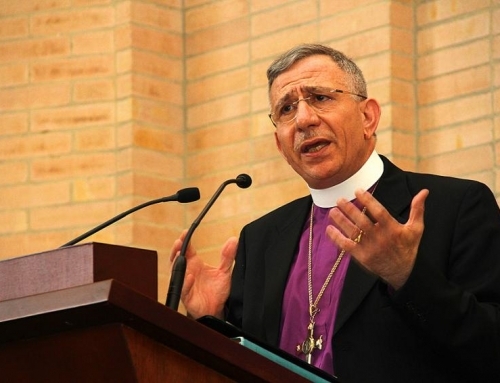 +“The Palestinian People as a Theological Issue,” a talk delivered at the 2nd Colloquium of Jesuits in Jewish-Christian Dialogue, Jerusalem, June 27-July 2, 2000, online at http://groups.creighton.edu/sjdialogue/documents/articles/jesuit_jewish_dialogue_02.html. +“Jesus Christ in Christian Faith,” in Father Rafiq Khoury and Dr. Mustafa Abu Sway, Jesus in the Christian and Muslim Faiths. Jerusalem: PASSIA, 2007. +“Identity: Meaning, Components, and Dimensions,” Al-Liqa’ Journal, online at www.al-liqacenter.org.ps/eng/p_materials/Identity/php, n.d.
+ “The Theological Implications of the Current Situation in the Holy Land: From the Point of View of a Christian Palestinian, in William T Cavanaugh, Jeffrey W. Bailey, Craig Hovey, eds., An Eerdmans Reader in Contemporary Political Theology. U.K.: William B. Eerdmans Publishing Company, 2011, pp. 566-584. ***Saliba Sarsar is Chair of the HCEF Research and Publication Committee and Professor of Political Science at Monmouth University.